Friends, for the first time in this world what I am sharing is not done by anyone yet. All of which will surely help you. 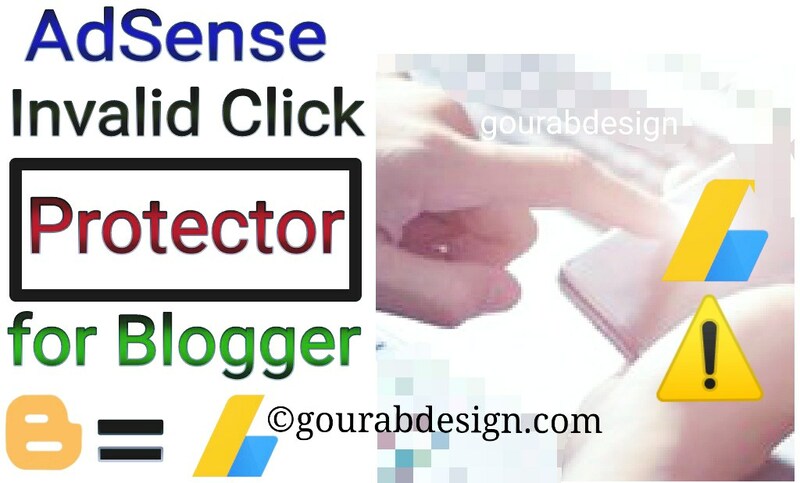 Today we are discussing most important topic solution How to Install Powerful Google Adsense Invalid Click Protector For Blogger . So keep reading. Everyone dreams that he has his own website. And it shows Google Adsense Advertisement. This is my dream too. To finish this, we work hard every day, after which it gets its approval. The problem does not happen then. The problem occurs when it is approved. Through it, we earn a lot of income, but some people who burn us do so much to make it suspend. Those people frequently click in our site's advertising, which causes the close. Invalid Clicks Fraud may be a frightening specter for publishers and not even publishers. Why? Because it can indeed disrupt the sovereignty of our adsense account. If we are often attacked by click fraud, it will endanger. Our account can be banned / suspended even if you do not click on your own ads. Google has its own system to detect invalid clicks or fraud. This is indeed not preferred by adsense even if we do not commit fraud. But Google certainly does not want to be cheated and harmed because cheating can be done in various ways, you can buy services like send clicks, change ip, etc. so it can still detect fraud. Google itself does not provide a script to avoid and stop this. Then what if click fraud occurs? We are required to report to Google itself so that we do not indicate that we have committed . For wordpress users there is a way so that when there is an excessive click it will be given a report so that we can report. How about bloggers? ✓ Now Touch the Template Option. ✓ Finally touch the EDIT HTML . ✓ Now search </body> tag. Save the template. Now that's the Script Anti Boom Click for Blogger, which I can share, If you get help from it, please share it in social media. So that everyone can benefit . 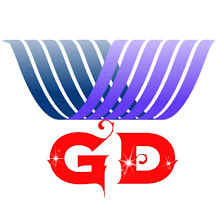 Gourab Das is a young and challanging web, graphics and logo designer. 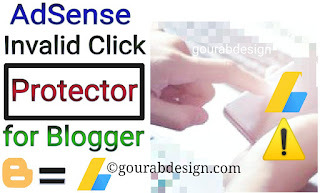 Gourab Design provides high quality Pro and free blogger themes. Also sharing blogger widgets and Blogging Tips as well as. Bhai! Apne to blog PR yeh code LGA liya hota. Mene to 25 she bhi zyada click kite. Kitna kmaya ya lut gaye. Hi bro. Thank you so much. Real me 14 click ke paise mile hai. Aur Adsense me 14 hi click hai apke ip se. Baki ke 11 click jo kiye ho woh is script ke karan nahi hua. Kyoki isko maine isi tarah hi design kiya hai bro. So next bar is baat ko yad rakhna. Maine to sirf script share kiya. Pura js share nhi kiya. Kyoki tumhare jaise logo ko kabhi bhi pura js nahi dunga. Aur ha last me ho sake to abhi bhi click kro. Bye and dhanyabad. Hum jaise bade Blogger tum jaise logo ke karan hi amir huye hai aur hote rahenge. Thanks and keep visiting. Gourab Sir Abhi Invalid Click Se Koi Farak Nahi Padta he kyoki Adsense ne pahle Youtube par yeh lagu kia thaa then blogs par bhi lagu kia hai. Yes ji. Kuch insaan kabhi bhi dusro ki bhalai nahi chahta hai. Uper ki ek Comment padh sakte ho. Un logo ke karan hi google ko yeh kadam uthana pada. Thank u ji for your valuable reply. Sir aapne uper ek Comment me likhe ho ki dusra ek script hai jo alag he. So please sir woh mujhe send kr sakte ho? . please sir. Mene apke fb par msg kiye he waha bhejo please please. Ok dear. Keep visiting my website. Iske liye template ke andar coding krni hoti hai. Jo ki css and JavaScrip ki hai. bhai script kam nhi karta... ads ke upar click hota rahata hai baar baar...protection kaha hua bhai?? Bhai Mujhe Ek Baat Bataiye plz bhai.. A Invalid Click protector kam Kaise karti hai..Or Kya ya Sahi mai 100% Work karti hai.. sir plz bataiye sir..
Don't worry. Yeh sahi se kaam krta hai. Yeh script apke site me jitne bhi viditors aate hai unke ip address ko note krta hai. Aur over click jo bhi kisi bhi cheez matlab ads pe krta hai to woh usi ip ko ads show hone se rokta hai. So bhai Don't worry. Hi bro. Main sure kosish karunga is bare me post ya video share karne ki.